Praha is situated about three miles east of Flatonia, south of the Southern Pacific Railroad, on the Jesse Duff league. Located on a hill in a beautiful liveoak grove, it presents a very fine view. The high steeple of the Catholic Church may be seen for miles reminding the faithful of the place of worship. The Catholic Church of Praha is the finest in the county, nay even in the state — a very majestic structure. It is a solid rock building. The aisle of the building is very high and makes a most solemn impression on the beholder. The altar is a masterpiece of artistic carving and construction. The imposing glass windows contain paintings representing scenes from the Holy Scripture. Rev. Father L. P. Nethardus is the priest of the church. Praha is a nice town, being built around a public square. It consists of two stores, two saloons, one blacksmith and wheelwright shop, a meat market. It has a resident physician. Jos. A. Drozd and F. A. Parma are the leading merchants of the place. Frank Vyvjala is the popular proprietor of a first-class saloon and owns also a fine platform and hall for dancing. Anton Jezek is the proprietor of a blacksmith and wheelwright shop and is prepared to do all kinds of work in tip-top style. The population of Praha and neighborhood is entirely Bohemian. The Bohemians commenced settling in this neighborhood in the fifties. First settlers: M. Novak, F. Branitzky, Jos. Vyvjala, Geo. Morysek, Jos. Hajak, M. Jares, Jno. Baca. The place was named Praha by Postmaster E. Knesek in 1876. It was formerly called Mulberry. The first Catholic Church in Praha was built of wood in 1868. In 1875 a new church was built. The present rock building was completed in 1891. In Praha are two lodges of the K. J. T., a Bohemian Roman Catholic Union of Texas, a benevolent society, which was organized in 1895 at Moravan, Texas. (See Moravan [Hostyn]). F. A. Parma is the president of this union. The president of one of the Praha lodges of the K. J. T. is Chas. Lev, the secretary, John Vanek; the president of the other is Vinc. Darilek, the secretary, Anton Jezek. The total membership of the two Praha lodges is from 80 to 90. The Catholic Young Men's Society is composed only of unmarried persons. They pay to each member at his wedding a marriage portion. Quite an inducement, thought it may be presumed that the lady is the highest. The society has about thirty members. Other societies are the Christian Society of Married Women (over thirty members), Altar Society of Virgins (twenty members) and a Reading Club. All these societies are Bohemian Catholic Societies; they are associated for worthy objects and tend to elevate and educate the character of young men and women to a higher plane. 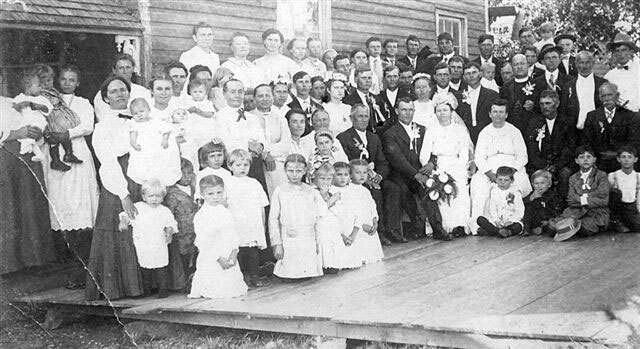 The couple to the left of the groom are his parents, Michael and Frances Oharek Okruhlik, and to the right of the bride are her parents, Frank and Josephine Krejci Cerny, at whose home the photograph was taken. The priest is the Rev. L. P. Netardus. Others pictured include Matous and Josephine Okruhlik Levek, Anna Schrear Okruhlik and Vince Okruhlik, also John, Rudolph, Joseph and Johan Okruhlik and Victor, Frank, Louis and Luka Cerny. Contributed by Joe Levek. These brief histories were written by members of the Fayette County Historical Commission. They first appeared in the weekly column, "Footprints of Fayette," which is published in the Fayette County Record, Banner Press, Flatonia Argus, Schulenburg Sticker, and Weimar Mercury newspapers. A new article appears weekly. See index of all Footprints of Fayette articles. Praha, a small community situated a mile west of Engle and 3 miles east of Flatonia in southern Fayette County, is a very old settlement established about 1842 on the James C. Duff League by Duff, William Criswell, his brother, Leroy and others. William Criswell signed the Texas Declaration of Independence in 1836 and upon his death, was buried in the Criswell Cemetery a half-mile east of Praha. His remains were moved to the State Cemetery in Austin in 1933. The community was first called Mulberry after a branch of the West Navidad River that flowed through the area. Mulberry was also called "Hottentot" as a nickname after the outlaw element that frequented the place. Later, the Czechs of the area changed the name of the town to Praha after Prague, Czechoslovakia. During the mid 1850's Czech immigrants settled in the area headed up by Mathias Novak. After working a short while for the Anglo settlers, he bought 100 acres of land and built a house. The first Catholic masses were held in his home. Other early Czech settlers were John Baca, Joseph Vyvjala, Andreas Gallia, Joseph Hajek, Frank Vacl, George Morysek and Ed Knezek. Ed Knezek operated a general store and was the postmaster. He was robbed and killed but his wife continued to operate the store. In 1865 Rev. Joseph Bitkowski directed the construction of a small frame church that was dedicated at a Midnight Mass on Christmas Eve. Mathias Novak has a special graves stone attesting to the fact that he gave the land for the church grounds. In 1868 a public school was established and by the 1880 Praha had three stores, a café, and a new frame church. A post office started service in 1884 and in 1896 a Czech Catholic School was established. In 1873, when the Southern Pacific railroad was built about a half mile north of town, Flatonia, a new town built on the tracks 3 miles farther west, began to draw business away from Praha. During the 1900's the population never rose above 100, and in 1906, the post office closed. In 1973 both the Catholic School and the Public School closed. The Public School building has been converted into a residence. The population of the town is currently about 25 people. An annual celebration of the Feast of the Assumption on August 15th attracts more than 5,000 visitors, as does a yearly Veteran's Day celebration on November 11th. It would be well worth your time to visit the community and to study more of its history. 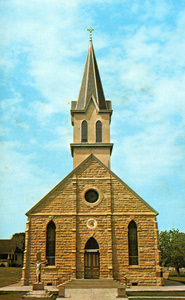 Postcard photo of St. Mary's Catholic Church at Praha taken by Warren O. Albrecht. In this age of endless shopping opportunities, including online purchases and drone deliveries, all to satisfy our need for instant gratification, we cannot imagine how our forefathers managed to survive without the stores and products that we take for granted. Think back to the time after the Civil War….a time of reconstruction, scarcity of money, few roads, limited transportation means and language barriers. All of these factors made purchasing goods difficult, so people oftentimes just went without, or learned to recycle, re-use and repurpose. Self-sufficiency was a necessity. A wagon pulled by a team of horses was the most practical mode of transportation at the time, but not every farmer had more than one horse, making traveling even more laborious. Unless there was a small store in a nearby community, farmers might have to travel 12 to 15 miles one way to buy supplies, which would take all day – a day away from working on their farms. Many farmers had little money, so bartering and buying on time or credit became necessary practices. Paying off a store account oftentimes depended upon a successful crop. One early settler in the Mullberry (Praha) area of southwestern Fayette County understood the plight of his fellow countrymen and decided to capitalize on an opportunity. Sometime after his first wife’s death in 1866 but by 1870, Ondrej Gallia, who emigrated from Moravia in 1860, decided to open a store on his farm. How could a small store in the middle of nowhere survive? Actually, Gallia’s farm was close to the old La Bahia Road, which passed Praha on the southeast, crossed the old San Felipe de Austin Road (Gonzales-Columbus Road) about a mile southwest of Komensky in Lavaca County and then went on to Goliad. This old road provided access to Gallia’s Store that initially provided a source for basic needs – sugar, salt, seasonings, shoes, fabric and sewing notions, as well as a few other food and clothing items. Plus, Czech was spoken there, which facilitated transactions and provided the opportunity for socialization and an exchange of news. One of Gallia’s ledgers, called a “Day Book” with entries from 1872 to 1876, is still in the family. Many of the entries were made by his son, Valentin, when he was in his teens. Even though some of the handwriting is not legible, and many pages are frayed and water-stained, there are enough legible entries for credit purchases to provide insight regarding the patrons, their purchases and their payments. Some people were advanced cash on their accounts, so the store also functioned as a bank that made loans, charging interest on the unpaid balances, and taking and holding notes. Ten percent simple interest was charged. Actually, this is the way some rural banks got started – a shrewd store owner with a good business sense eventually became a banker. In the Day Book, the landowner’s name was listed under a tenant farmer’s name. In some instances, the landowner made payments on the tenant’s account. Several entries made reference to other books, but only this one book survived. There were approximately 74 patrons listed in the extant Day Book. Some of the items that people received credit for were: 14 chickens - $1.75; 115 eggs – 75 cents; one cow - $18.00; butter – 75 cents; and a bushel of corn – 75 cents. Those who obtained a credit balance would receive cash from the store. Some people would actually “work off” their debts. There were entries for “labor for one year on the Gallia farm” and picking cotton - $4.30. With increased prosperity, more items became available in the store. When the railroad was built through the area in 1873, Valentin Gallia would ride it to Houston to make purchases if certain items were not available in La Grange. The worst part of the all-day wagon trip to La Grange, according to Valentin, was having to carry kegs of beer up the steps from the cellar at Kreische’s Brewery to his wagon. It seems that all of the beer that was purchased by customers was consumed in the store, along with shots and quarts of whiskey. The one and two-gallon whiskey purchases were consumed elsewhere. One patron liked brandy and another preferred gin. A sampling of items and their prices listed in the Day Book are as follows: accordion - $6.40; beer – 25 cents/qt. ; boots - $4.00; cheese – 15 cents; coat and pants - $7.50; dress - $4.00; pistol - $2.50; purse – 40 cents; trunk - $4.00; watch and chain – 50 cents; and woolen fabric – 45 cents/yd. After Ondrej Gallia’s death in April 1876, Valentin had to collect the balance due on accounts in order to settle his estate. Ondrej’s younger sons continued to work in the store until his widowed second wife remarried; she eventually closed the store, although the exact date is unknown. Gradually, other entrepreneurs in the small communities throughout Fayette County began opening more and more stores that phased from general merchandise stores to specialty stores – there were jewelry stores, millinery shops, dry goods stores, cobblers, tailors, hardware, furniture and grocery stores, to name a few. When mail order catalogs were introduced, people in the rural areas could purchase almost everything on their “wish list”, very much like our online shopping today. The following article was printed in The Schulenburg Argus on April 6, 1877. It is presented exactly as written. Note the style of writing, which was very descriptive and typical of that era. It appears that people at that time united to take action when necessary and celebrated their success, no matter what day of the week. From Mr. Chas. A. Kessler, the ARGUS learns that on last Tuesday there was a picnic at the Bohemian school house on Mulberry creek, about three miles from town. A large crowd was in attendance, many going from here. We regret to say that we did not hear of it until too late to go. There was a presentation of a flag, speechifying, dancing, target shooting, etc. Having said this much, it is necessary to be more explicit, and tell what was the object of the demonstration which partook of such a variety of amusement. In the first place, the citizens of that neighborhood have suffered a great deal with depredations on their stock, which has become annoying in the extreme, and their patience in the law and its administration has become exhausted. Hence they resolved to organize a “Committee of Safety” – not a vigilance committee – whose duty it would be, upon a report of a loss of stock being made to them, to appoint a certain number of its members to go to the proper authorities – not to lynch them – for punishment under the law. Having resolved upon this course, their wives, daughters and sweethearts concluded that it would be meet and proper that a flag should be wrought, which they did, and last Tuesday was the day selected for its presentation. Of course, to give zest to the occasion, something besides the mere formality of presenting and receiving the flag seemed to them – and we think very properly – necessary. There must be some enthusiasm, some show of good feeling in the matter on their part. They were not on the war-path, they were simply improvising means to keep secure that which they had earned by the sweat of their faces, and be instrumental in aiding the officers of the law in bringing to condign punishment any who might dare despoil them of their property. Hence speeches were in order to explain the objects of the organization, and Messrs. Kessler, Glucksman and others made excellent speeches. After the talking was over, the target shooting took place, with the rifles at 140 yards with a rest, and Schulenburg bore away the victory, Mr. Louis Ahlers making the best shot, and Mr. Proetzel the next best. A nice floor had already been prepared, and when the shooting was finished, the merry dance began, which was kept up all the afternoon, and until a late hour at night, the best of feeling prevailing. When the crowd dispersed, all were well pleased with the day’s recreation. In the space of 12 months and nine days, Praha gave up most of its youth – and nearly all of its future – to confront unimaginable forms of evil on faraway continents. Pfc. Robert Bohuslav died Feb. 3, 1944, after Patton’s and Rommel’s tanks had already driven deep into North Africa , and the worst of the combat had passed. Three more sons of Praha went down in France , beginning the week after D-Day. The War Department sent notices of death to the families of Pfc. Rudolph L. Barta, June 16; 1944; Pfc. George D. Pavlicek, July 7, 1944; and Pfc. Jerry B. Vaculik, July 23, 1944. In Italy, Pfc. Adolph E. Rab became a casualty of war two days after Christmas 1944. Pvt. Joseph Lev, shot in the stomach during the attack of Luzon Island , died July 24, 1944. Pfc. Anton Kresta Jr.’s life ended in that same tropical theater on Feb. 12, 1945. On Sept. 7, 1944, Pvt. Eddie Sbrusch was lost at sea in the Pacific. Nineteen days later, Pfc. Edward J. Marek died in battle at Pele lieu Island . All their lives were lost, ironically, as an Allied victory appeared inevitable. The soldiers are buried in the Praha cemetery in two rows of four and three; Eddie Sbrusch’s empty grave lies just to the northeast; George Pavlicek’s remains rest in a family plot across the walk. The graveyard is unprotected from the pressing Texas sun, but nearby a centuries-old post oak tree reaches out with a promise of eventual shade. At the outset of World War II, Flatonia and Praha were no different than many other rural communities across the American landscape. Patriotic fervor led people to gather scrap metal and rubber, delivering the materials further east on the rail line to the larger town of Schulenburg . Young men were coming in from the countryside to enlist and say their goodbyes before leaving for boot camp and deployment overseas. To call it a simpler time, though, is to belittle the emotional and intellectual complexity involved in the decision to serve. Even along the dirt roads of Fayette County , Texas , families understood that Hitler and Japan represented more than just a threat to Europe and the Pacific. Behind the church at the gated entry to the cemetery, a memorial stands to honor the lost sons of Praha. Names and photos are arranged in a perfect row along the bottom of the marble pedestal. Dates and locations of their deaths are carved into the stone. No one can easily enter the cemetery without first confronting the rock monument and pondering the wives and children these men never knew, the work they never lived to perform, the dreams they never pursued. Understanding may prove eternally impossible. But if every leader of every country were first made to visit Praha before declaring war, the world might be forever changed. July, 1937 was a busy month in the then little community. The main topic of conversation was the announcement that electric lights will soon be available. W.S. Johnson, manager of the Flatonia Central Power and Light Company, states that: “if supplies reach us in time and work continues as we hope it will, the new Praha electric lights will be ready for use on August 1.” The line from the Flatonia substation to Praha is being added to the telephone poles on the highway along which the main trunk line now runs. The line crew is composed of eight or ten men and is being supplemented by extra local help. Mr. Johnson stated that when the proposed 150 lamps are turned on; the Praha Church and grounds will be one of the most attractively lighted places in this section of the country, if Rev. John Anders plans are carried out. Sixteen customers including business houses, residences and the Garbade chicken farm will also be fed from this 11,000 electric line. Transformers will lower the voltage to 110 volts to supply the newly installed meters. Residents of the “The Old Mother Parish”, as it is known to most everyone in this section, are diligently preparing for the annual homecoming celebration to be held Sunday, August 15th . The sons and daughters of the Praha section return to their old home to meet friends and enjoy the day as guests of the parish. Since the date falls on Sunday this year, an unusually large crowd is expected to be present during the day as well as in the evening. The celebration begins with solemn High Mass at 9:30 a.m. in the old and venerable church of Praha, with Rev. Dr. John Morkovsky (S.T.D.) of Weimar, a native son of the parish, as celebrant. Father P.P. Kaspar of Hostyn, lover of the Czech people, will deliver the sermon. A procession headed by F. Starry Brass Band with all the parish societies participating will be held before and after the services. At 11:15, the ladies of the parish will begin to serve dinner. The parishioners have donated over 2,000 pounds of meat for the dinner that will be served in the parish hall for the nominal charge of 20 and 30 cents. In the evening, a Czech play by the Praha Dramatic Club and the singing of a group of Czech songs will begin at 8 o'clock. At 2 p.m., Lt.-Governor Walter F. Woodul will be the principal speaker, according to the Rev. John Anders, pastor of the Praha Catholic Church. Mr. Woodul is a matter -of- fact Governor of Texas at the present time, since Governor Allred is visiting in Mexico this week. Other noted speakers will follow him. Loudspeakers will be on hand in order that the crowds expected may hear all of the speakers during the afternoon. At 5:30 supper will be served. 10 and 20 cents being charged. A dance at the new, lighted Praha pavilion is scheduled to conclude the day’s festivities. The Adolf Migl Orchestra will provide the music. Admission for the dance will be 25 cents each for both gents and ladies. Praha parishioners boast of their large and spacious parking lot for autos. For the cars can be parked in front the church and hall, but also around the parish house and school. The many beautiful shade trees about the grounds provide a boon from the heat of the day. Many visitors will have their first opportunity to see the new 110 volt electric power line illumination system Sunday evening. [Electric lines were run to Praha several weeks prior.] There will be plenty of refreshments served on the grounds; however, no chances of any kind will be sold on the grounds. “They will celebrate at Praha rain or shine” stated Rev. Anders the day after the picnic. Despite the inclement weather, a crowd in the thousands stayed all day. The meal started earlier than planned and both floors of the huge St. Mary’s Hall were filled with tables. With intermittent rain falling, Master of Ceremonies Rev. Kaspar announced that Lt. Governor Woodul had wired his regrets the day before that he could not attend. Filling the speakers podium that afternoon were San Antonio mayor and Columbus native, C.K. Quin [future federal judge, candidate for Senator, and notoriously corrupt], Senator L. J, Sulak [Texas State Senator representing Fayette County], Representative Gus Herzik [representing Fayette County], Walter Malec of the Hallettsville Tribune, Honorable B. P. Matocha, and Charles Lockhart, Texas State Treasurer. The rain soaked crowd strained to hear the dignitaries, as the loudspeaker system promised from the Piggly Wiggly Company did not arrive due to a sickness in the owner’s family. The Bohemian play realized over $50 for the parish. That evening over 1200 tickets were sold to the dance in the new, electrified pavilion. Manager Ed Stavinoha stated that after the tickets were sold there was a great deal of room on the new dance floor. During the day something over $1700 dollars was taken in resulting in a profit of $1000 for the parish. Additional clergy present that day included: Dean Jos. Syzmanski of Weimar, Rev. Leo Goertz of Schulenburg, Rev. Jos. Pustka of Flatonia, Rev. Alois Morkovsky of San Antonio, Rev. Edmund Bily of Shiner, and Rev. Theo. Janysek of Cistern. Editor’s comment: This event seventy-six years ago illustrates a few of the changes that have occurred in church picnics in the last half of the 1900s. Bingo, cakewalks, and other games of chance were introduced. Attendees were willing to stand in the rain for hours to listen to politicians, and they didn’t have to go home because it was dark. Flatonia, Fayette Co., Tex., Nov. 21.—The little village of Praha, in this county, was the scene of the grandest affair in its history yesterday. The occasion was the dedication of the Catholic church at that place. About 10,000 people were present, consisting principally of Germans and Bohemians. The dedication services were performed by Rt. Rev. Bishop J. A. Forest of San Antonio, assisted by about twenty priests. The church is a fine structure, built of rock and will last for all time. It will seat about 1000 people, but only a small portion of the crowd could gain access yesterday. The reception accorded to Bishop Forest was flattering in the exreme. When the Southern Pacific train arrived from San Antonio the bishop was met at the depot by a large crowd of people in buggies, wagons and horseback. The Flatonia city band was also in attendance, dressed in their fine new uniforms. The procession led by 100 horsemen, then began the march to Praha, distant about three miles from Flatonia. After the dedication services three sermons were preached, one in German, one in Bohemian and one in English. There were people present from this and several adjoining counties, and altogether the occasion was one long to be remembered by those participating. Mr. J. Sima's Picturesque Place. Mr. J. Sima of Praha is the affable proprietor of one of the most modern and unique dancing pavilions and picturesque flower gardens in Texas. The former located immediately to the rear of his saloon is about 25 feet in diameter and of circular form. In its construction an appreciation of the beautifies of nature was displayed by the protection afforded the pretty shade trees which instead of having been felled, were provided for by an opening being made in the floor of the pavilion, thus making the effect at once unique and delightful. The band stand is located under a clustre [sic.] of trees, the shade from the branches of which completely protects the musicians from the rays of the sun however warm the day. The flower garden with its variegated blossoms and dozens of banana trees, the latter with fruit both maturing and matured is in itself well worth a trip to this typical Bohemian town. The shrubbery is bountifully watered by an artesian well 190 feet deep which flows 6000 gallons per hour, forcing the stream twenty feet above the ground. Mr. Sima gave a dance and barbecue to his friends Sunday last and entertained them in the most royal manner. The Moravia brass band provided music for the several hundred guests present while the host supplied the most substantial edibles in abundance. The editor of the Sticker is under especial obligations to Messrs. Sima and Albert Kubianon of Flatonia for the many courtesies extended. The Praha Catholic church in charge of Rev. Father Viana is one of the most successful parishes in Texas. The building which, is of Muldoon stone, ad was erected at a cost of $30,000 being an evidence of the faith and good work of its members.